December 28th 2009 completed with the grace of the All-Good God 200 years from the venerable dormition of a worthy spiritual person of the Philokalic Renaissance movement, who shone forth as a new cenobiarch, becoming an example of austere ascesis and ceaseless prayer, meekness and discernment, philanthropy and humility. 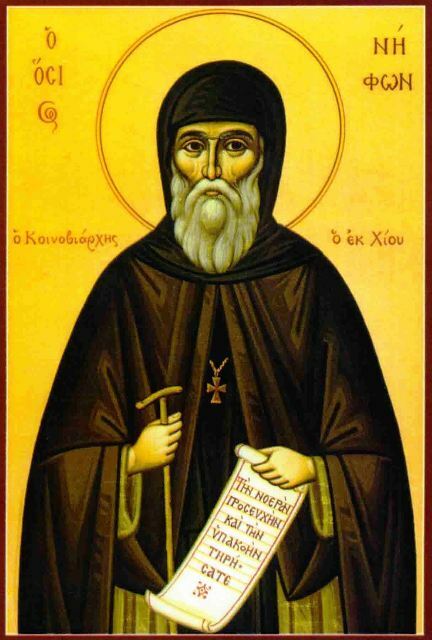 The Venerable God-bearer Nephon, who was given the title cenobiarch, contributed to the growth of monasticism with the founding of hesychasteria and monasteries on the islands of the Aegean, struggling together with the other Kollyvades fathers for the preservation of the spirit of Orthodoxy, the spiritual regeneration of the people and the return to the ancient ecclesiastical tradition. He was born in 1736 in the town of Patrika of south Chios, and he lost his parents from the epidemic of the plague, at an age when Nicholas (his worldly name) was still an infant. He was taken-in by one of his aunts and when he reached adolescence, he left for Constantinople, where he apprenticed with a merchant. However the unexpected and dramatic murder of his friend by some Janissary, filled his soul with grief and despair. This terrible occurrence compelled him to leave Constantinople and head to Mount Athos. His first stop was the Monastery of Great Lavra, but after a short time he left for the Pantokratoros Skete, of today's Kapsala, where he was tonsured a monk with the name Nephon. Although he never studied at a school, he comprehended the Holy Scriptures and the writings of the Great Fathers of the Church with the grace of the Holy Spirit, and he nurtured special reverence for the Most-Holy Theotokos. Together with the renowned author Alexandros Papadiamantis, the Venerable Nephon struggled in asceticism together with other virtuous monks in the desert skete of Saint Basil high on Athos. However because of the turbulent period of the spiritual movement of the Kollyvades the Venerable Nephon, who had been ordained a priest, was shaken by the exacerbation of problems that arose and led to tragic events. The basic causes of conflict were the Kollyvades denying to perform memorial services on Sunday, which as is known is the day of our Lord's Resurrection. In 1772 the Kollyvades prepared a petition to the Holy Synod of the Patriarchate of Constantinople, which together with the confession of faith they sent to Constantinople the monk Nephon. Patriarch Theodosios II adopted a synodal decision, with which he justified both conflicting sides. Then Nephon returned to Mount Athos without receiving the patriarchal decision. Seeing this grievous situation he planned to leave the Holy Mountain to be with Saint Athanasios of Paros (1721-1813), who emerged as a brilliant representative of the so-called Kollyvades movement. Thus Nephon was forced to take refuge on various islands of the Aegean. 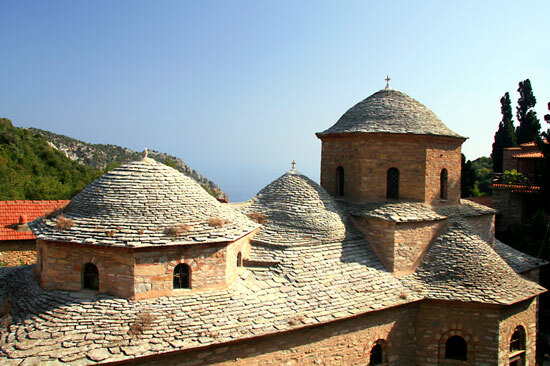 His first stop was the fragrant and holy land of Chios, his beloved home, but after a short stay he traveled with his brotherhood to Samos, where for a few months they inhabited the old monastery of Saint Kyriaki, close to the town of Maratokampou. From Samos the Venerable Nephon along with the hieromonks Gregory of Nisyros, Athanasios from Armenia, and Arsenios Moraites reached Naxos, where they remained at the historic monastery of Panagia Phaneromeni. In Naxos they met Nicholas Kalivourtzis and the subsequent eminent Philokalian father and bright teacher of Romiosini Saint Nikodemos the Hagiorite (1749-1809), whom they convinced to follow the monastic life on the Holy Mountain. After Naxos they traveled to Patmos, where they met the honorable and God-bearing hierarch of Corinth and the founder of Philokalism, Saint Makarios Notaras (1731-1805). At this point the special spiritual relationship which developed between the Nephon and Makarios Notaras should be emphasized. Then Nephon together with Gregory of Nysiros visited Leipsous, where in the deserted area of Romani they built the chapel—hesychasterion of the Annunciation of the Theotokos from their great reverence towards the person of the Most-Holy Theotokos. In Leipsous the Venerable Nephon remained for a few months, after the pirate raids convinced him to abandon the island and to go to Phournous around 1775, where there also he founded a chapel-hesychasterion in honor of the Annunciation of the Theotokos. The same year he began the founding of the holy monastery of the Annunciation of the Theotokos in Lefkada a short distance from Agios Kerykos, the capital city of Icarus. Indeed on the lintel of the Katholikon of the monastery it bears witness to the year of its founding: “The following holy monastery was built by the most-venerable hieromonk Nephon, 1775." It is noteworthy that the influence of Makarios Notaras, who visited the monastery of Icarus and remained with them for a sufficient period of time. Indisputable testimony of the gracious presence of Saint Makarios in the monastery are the ruins of the cell in which he stayed, along with the chapel built in the name of Saint Makarios after his venerable dormition on April 17th 1805. The historical Monastery of the Annunciation of the Theotokos on Icarus was the blessed spiritual refuge of the God-bearing Kollyvades ascetics and remained an exemplary cenobium, where during the days of the Venerable Nephon the founder, the number of monks reached 25. It is also worth noting that the inhabitants of Icarus especially loved this Kollyvades monastery with the hospitality of Abraham, and it was known that the gates of the monastery were always open to all visitors, who found a rich meal and place to rest. Moreover a multitude of people traveled to the monastery to be spiritually led by the meek, discerning and clairvoyant Elder Nephon, who was shone as a trainer of monks and guide of ascetics, making the monastery a center of intellectual and spiritual ascesis for the prospective clergy. In 1778 the teacher of the Patmiada School, Gregory Chazestamatis of Skiathos, learned of the virtuous Elder Nephon and the well-known Monastery of the Annunciation of the Theotokos in Icarus and decided to leave Patmos, where he was, to travel to the Kollyvades monastery. There he was tonsured a monk and proposed to Nephon to leave Icarus and move to Skiathos, where his father Gregory had large plots of land. Thus in 1794 he reached Skiathos to found the holy monastery named Annunciation of the Theotokos. The founding of the monastery began in 1794 and in September 1797 the monastery was proclaimed patriarchal and stavropegic. 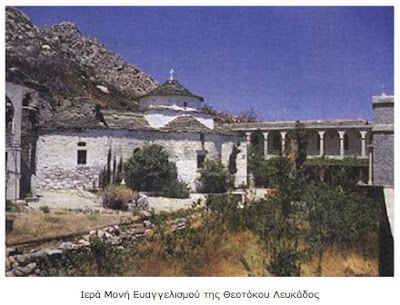 In 1798 Papa-Gregory Chatzestamatis became the lawful inheritor of the family estate, which he gave to the monastery, which became known as the spiritual center and refuge for the inhabitants of Skiathos during the dark period of the Turkish occupation. Indeed in September 1807, 1400 Greek freedom fighters persecuted by the Turks traveled to the monastery from all over Greece. In this great gathering of captains and fighters, Elder Nephon blessed the first Greek flag, which the National Assembly at Epidaurus in 1823 designated as the official flag design of our nation [Greece]. However the Venerable Nephon slowly began to seek greater silence and solitude and because of this he decided to return to his beloved Icarus. However his desire never came about, because in December 1809, sensing his earthly end beforehand, he called his six novices and told them to go to Icarus to renew the historical monastery, which he so greatly loved. Thus on December 28th 1809 the divinely-taught and landless Nephon left his earthly life, receiving the crown of glory from the freely-granting Lord. He was buried in the cemetery of the Monastery of the Annunciation in Skiathos, and all became witnesses to the first miracle: a monk, who was a paralytic for many years, was healed, when he embraced the honorable body of the blessed Elder with reverence. In 1812 the uncovering of the holy relic of the Saint occurred, which emitted an indescribable fragrance, and was evidence and certification of his holiness and wonderworking. Indeed until 1876 Alexandros Moraitides confirmed that the honorable skull of the Venerable Nephon was preserved in the monastery. May the divinely-inspired and virtuous Saint Nephon, the pious offspring of the holy land of Chios and the fragrant boast of the islands of the Aegean, teach us and instill in us spiritual things with divine zeal and depth of faith, with his meekness and patience, with his indigence, his humility and with the true Orthodox ecclesiastical spirit, as he bequeathed to us the blessed choir of Kollyvades fathers with the momentous apostolate to the Greek Orthodox of our people. On the timeless worth of this spiritual movement, Monk Moses of the Holy Mountain notes: “The Kollyvades movement is very topical, when again many wish to offer in the Church comfort without ascesis, joy without struggle, happiness without joy-making sorrow, innovations without knowledge of the austere precision of the evangelical tradition of holy fathers." 1. Δημητρακοπούλου Φωτίου Αρ., Ο Όσιος Νήφων (1736-1809) και η Ιερά Μονή Ευαγγελισμού Σκιάθου, Εκδόσεις Ergo, Αθήνα 2004. 2. Κανέλλου Κωνσταντίνου Π., Όσιος Νήφων ο Χίος –Ο ηγιασμένος των Κολλυβάδων, Εκδόσεις Επτάλοφος, Αθήναι 2003. 3. Σταματιάδου Επαμεινώνδα Ι., Βίος και πολιτεία του εν οσίοις πατρός ημών Νήφωνος κτίτορος της εν Σκιάθω ιεράς του Ευαγγελισμού μονής, Ικαριακά, εν Σάμω 1893. 4. Χαλκιά – Στεφάνου Πόπης, Οι Άγιοι της Χίου, Β΄ Έκδοσις, Εκδόσεις Επτάλοφος, Αθήναι 2008. Divine one of the Kollyvades, and the beauty of Athos, you were shown as a servant of your people, with the splendor of the Resurrection, as an initiate and sacred child of God, and forerunner shining forth nepsis, trainer of Neomartyrs, O Cenobiarch Nephon the most-holy one. Glory to Him Who gave you strength, glory to Him who made you wondrous, glory to Him Who grants to us through you, healing for all.